eLearning Brothers announces today it has acquired SolidStockArt.com, a premier stock photography company that focuses on high-quality images adding over 2 Million assets to the eLearning Brothers library. eLearning Brothers announced today that it has acquired privately-held SolidStockArt.com, a premier stock photography company that focuses on high-quality images. eLearning Brothers will be assuming the current operations worldwide and will now be able to more tightly integrate these high-quality images directly into the eLearning world. Solid Stock Art adds over 2 Million assets to the eLearning Brothers library. This acquisition expands the world’s largest eLearning library for CLOs, HR and training professionals, instructional designers, eLearning developers, K-12, Higher Ed and Corporate Universities. “When we launched eLearning Brothers in 2009, we committed to our members that we would provide them with the deepest and broadest eLearning library on the planet. Last week, we purchased Solid Stock Art to continue the growth of our library.” said Andrew Scivally, Co-Founder, and CEO of eLearning Brothers. 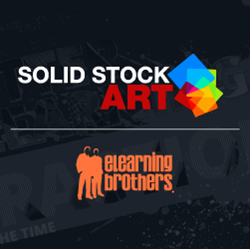 The website http://www.SolidStockArt.com will continue to act as a stand alone website for artists and designers to download stock art but will also be even more tightly integrated into the eLearning Brothers systems. These photos will be available through the Developer Package, Master Package, and Rockstar Package. “These stock photos are stunning. We looked far and wide for the highest quality images and we think we found them. This offering will be available for our current customers and will expand our reach into additional markets.” said Curtis Morley, President of eLearning Brothers. For further details on today’s announcement visit the blog at http://www.eLearningBrothers.com/press. eLearning Brothers is on a mission to create “eLearning Rockstars” by providing the planet’s largest and most interactive library of assets for rapid eLearning content development and customizable courseware. eLearning Brothers is also creating award-winning custom eLearning for Fortune 500 companies.